Sleeps 5. 2 bedroom apartment. A very comfortable renovated 2 bedroom apartment with wood floors, one shower room en suite and one bathroom with bath and shower, WC and wash basin. Fully equipped kitchen with ceramic hob, oven, fridge, dishwasher, fondu, raclette and expresso machines. A studio belonging to the same owner is located next door. Ideally located less than 5 minutes on foot to the Bahnhofstrasse and the village, the train station, as well as the Sunnegga and Gornergrat departure stations. Also at proximity the bus for the MatterhornExpress from where you can access Italy. From the living room and the balcony you have an amazing view of the Matterhorn. The bedrooms both have twin beds which can be made up as doubles, and one has an en suite. A second balcony gives off the kitchen. 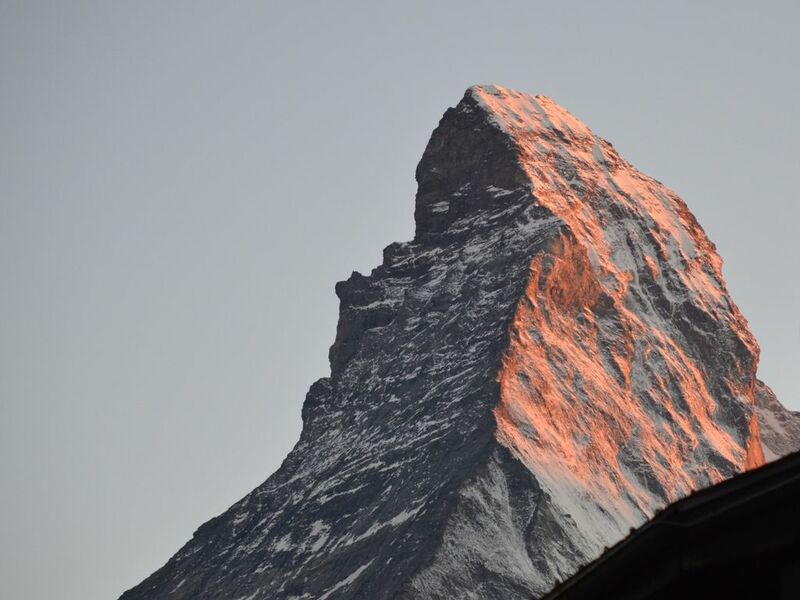 I have been going to Zermatt for over 20 years and have definitely fallen under its spell. The mighty Matterhorn towering above the little village can leave no one indifferent. I bought my first property in 1994 and this is where I live now, when I'm not in Geneva. My hometown was Wimbledon and I still return there on the special occasion that takes place at the end of June/beginning of July. I bought the Imperial property in 2001 and then proceeded to renovate it into an apartment I would have liked to have rented myself: two bedrooms, 2 bathrooms, close to the village and everything else. Later I added the studio which is next door with the idea that it would be nice for people to have a nanny or a granny close by, but not necessarily too close. Everyone who has stayed in this property raves about it. Skiing in general is very hectic, and the logistics of getting to Zermatt are somewhat complicated...but oh so worth it. The proximity of this accommodation to everything important really helps to hit the snow running...and then keep running all week. The visitors book is a joy to read... or should I say the online reviews! Dining area in the living room for 6. The kitchen also has a dining for 6. The ski area of Zermatt is vast and there is also access to Cervinia in Italy via the Klein Matterhorn lift at the southern end of the village. Zermatt is famous for its small, charming mountain huts serving amazing food at lunchtime. Cervinia in Italy provides a complete change of scenery as you see the Matterhorn from another angle, and it provides plenty of restaurants with wonderful Italian culinary delights. There is a 9 hole golf course just before Tasch. Notes on accommodation: Both the large apartment and the studio have been rated 4* by the Zermatt Tourist Office. Outside: Balcony furniture: table, chairs and parasol. It's a place not to be missed. Ann's Place - Haus Imperial is immaculate. She has put a lot of thoughts into making guest comfortable and enjoyable. Her entire apartment is fully equipped from the kitchen to the bedroom. Enough towers/shower gel in each bathroom. The space in the apartment is fantastic for a good holiday. Location wise, it is easy to find within walking distance of the BahnHof. 2 nearby Supermarkets. Down the road, it is near the Ski rental shop and also the Sunnegga ski slopes. I'm really pleased you enjoyed your time in my apartment in Haus Imperial and that you found everything you needed, and also that you appreciated the location and its proximity to everything! Thank you so much for the review. Very nice apartment with everything we needed. This apartment is very close to the train station, has a fabulous view of the Matterhorn, and is warm and cozy. Great place! So pleased you and the family enjoyed the apartment and thank you for the review. We had a wonderful holiday in Zermatt enhanced by this well equipped central apartment. Everything is close and the view from the balcony of the Matterhorn is just as the picture shows. We spent one day in Fiesch and climbed above the clouds to see Aletsch glacier- breathtaking! I will definitely be recommending this apartment to any friends visiting Zermatt. Thank you for taking the time to review and so pleased you liked the studio, its proximity to everything and the amazing view! Everything was well appointed and just as described. This was a perfect place to stay for our group of 5, and conveniently located near the train station, the town, and access to skiing. Thank you so much, Ann! We had a wonderful stay. Thanks for taking the time to write this very nice review and pointing out that everything was as described....very helpful for future guests! So glad you all had a good time and come back soon! Ann was wonderful! She promptly and politely answered my many questions. Excellent! The apartment is close to the train station and very centrally located. The view of the Matterhorn from the main balcony is stunning! I really appreciate you taking the time to write a review and am so pleased it worked out well for your family. Come back any time! Ann's flat was a treat to return from the trails to every day. My wife loved the superb view of the Matterhorn from her bed and the large bathtub where she soaked after full days on the trails. The flat was spacious with decks front and back, the kitchen well equipped, and it was conveniently located near markets and the train station. Ann dropped by and offered some helpful tips on hikes and eateries. Glad it worked so well for you and that your wife appreciated the view and the well-deserved bath! Look forward to seeing you back soon and thank you very much for the review. Zermatt is a car-free village and can only be reached by train, taxi or helicopter. If you are driving you must leave the car in Tasch and proceed by taxi or train. Trolleys for your baggage which you can take onto the train are available in the Parking at Tasch. You can take the train directly from Geneva and Zurich airports and the journey takes around 3 1/2 hours. The train arrives in the centre of the village and depending on your luggage you can walk to the apartment. Summer activities include walking, hiking, mountain biking, climbing, tennis and volleyball. There is also a Forest Fun Park (accrobranche) and for younger children there is a Wolli park near Sunegga with a play park, lake and a barbeque area. Booking Notes: To confirm the availability of the apartment please send an email or phone the owner. A deposit of one third of the rental is required at the time you make the booking, and the balance is due a month before arrival. Payments can be made in Swiss francs or euros. Changeover Day: Changeover day in the high season is Saturday. Arrival is at 15.00 and departure at 09.00. Notes on prices: Prices include bed, bath and kitchen linen and final cleaning. Tourist taxes are chf2.50 per person per day. Free WIFI.